K + M Extravirgin Chocolate preserves the potency of the cocoa bean while enhancing its health benefits by using EVOO as a main ingredient. From the culinary mind of the French Laundry chef Thomas Keller and a Tuscan olive oil producer Armando Manni, a new type of chocolate bar has emerged on the market. K + M Extravirgin Chocolate boasts an approach to preserving the potency of the cocoa bean and improving health benefits by using EVOO as a main ingredient. With the benefit of potent antioxidants, the treat is both tasty and nutritious. By opting to use EVOO instead of cocoa butter to create the sumptuous dessert, less saturated fat is used and the advantages of EVOO are included as an extra bonus. Most chocolate manufacturers develop their product using cocoa butter mixed in with cocoa powder — both ingredients derived from the original cocoa bean. At a high pressure, “cocoa liquor” made from cocoa beans is separated, leaving the dusty cocoa powder responsible for chocolate’s infamous flavor and the fatty part, cocoa butter, as its textual counterpart. The idea to develop a new technique came to the men five years ago as they began discussing the healing properties of dark chocolate and olive oil. The chocolate is made in a warehouse in Napa Valley, where the cocoa bean undergoes a delicate process of refinement to preserve the antioxidant properties which can be lost in traditional chocolate-making practices, the company claims. Ingredients include organic cocoa beans, organic sugar, organic Manni EVOO and organic soy lecithin. The bars come in three different varieties: The Peruvian bar shares a deliciously deep coffee flavor; the Ecuador bar suggests earthy tones with hints of chestnut; the Madagascar bar has an extra kick with spicy fruit highlights of pineapple and passion fruit. The olive oil made to produce the chocolate blend is not detected in taste, though it can be felt in the experience, as the thought of a guilt-free delicacy settles into your taste buds. “Our unique method of turning cocoa beans into chocolate…results in most luxurious antioxidant-rich chocolate,” the two innovators are quoted on their website saying. 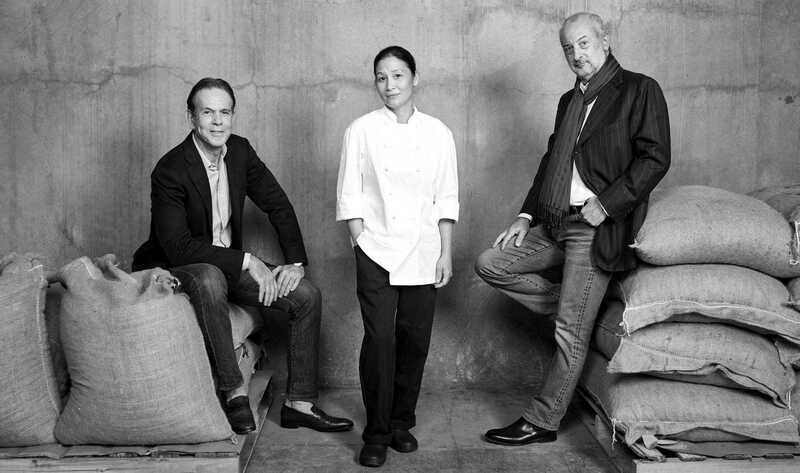 Pictured alongside them is Chi Bui, a chocolatier for K + M who is responsible for production in Napa. Bui is recognized as a pioneer in the “bean to bar” effort on the chocolate frontier, according to the company. As a chocolatier, she is interested in the amalgamation of health, science, art and gastronomy. 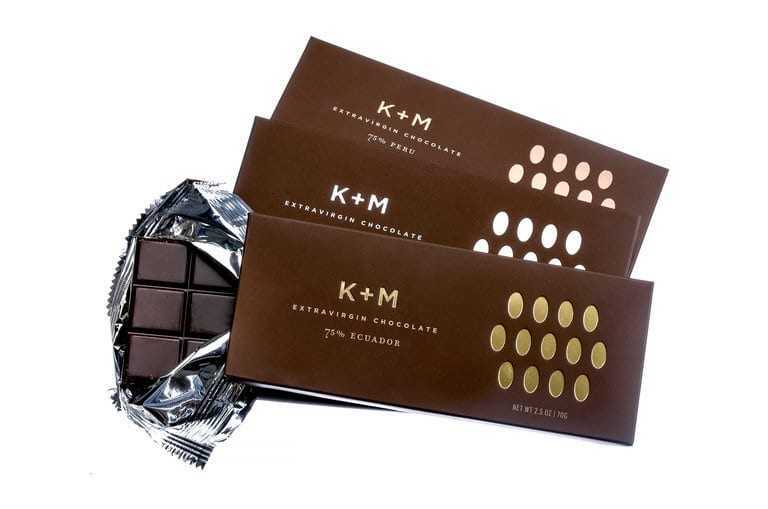 K + M Chocolates are available through their website and Williams Sonoma.